Mainly chose this one because it runs on 24V internally rather than 110/220V and many of the other models apparently use mains voltage through the foot switch! I paid extra for DHL shipping (about $20) and it arrived within a week. The model I received is a bit different from the one pictured. 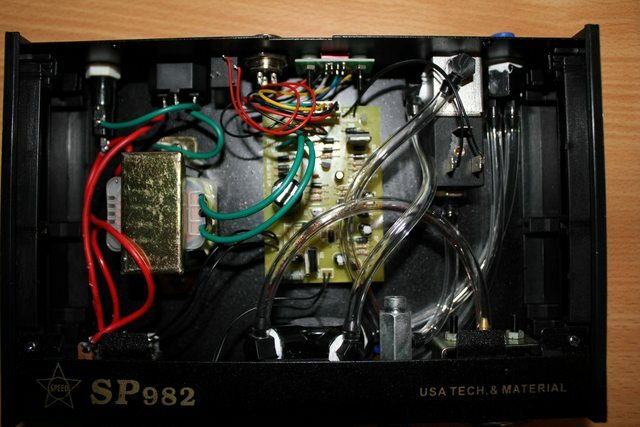 Its a Speed SP982 rather than a KLT-982A though there isn't much difference (they're all clones of each other anyway ) It has a screw in connector for the foot switch as well as a mono audio jack for an external trigger. Unfortunately, the finger button trigger in the pictures was not included (no big deal). I did a quick check internally to see what its like. Typical chinese construction but at least it has the ground lead of the IEC socket connected to the chassis. The foot switch and external trigger jack are wired in parallel. A potentiometer on the front sets the dispense duty cycle (0 to 100%) while a set of dip switches on the back set the overall time (1s, 10s, 20s, 30s). Each press of the foot switch triggers one dispense cycle. Holding the foot switch down does NOT continuously dispense shots. Another switch on the front puts in in manual mode where you modulate the dispensing with the foot switch directly. I'm running it off a small 21L 2.5HP compressor regulated to ~80psi. Regulator on the dispense unit is set to 50psi. I fill it up outside since its quite noisy. A full tank lasts for ages inside Solder paste is just "Mechanics" brand paste from DealExtreme which comes in a little pot. First test run turned out great. Video was filmed on my iPhone 3GS in pretty poor lighting so excuse the crappy quality I'll get some internal shots later. The internal control board looks like its just a 555 timer with some analog components. Looks pretty basic and it doesn't have to do much. I'm considering replacing it with my own board using a microcontroller, so I can also do continuous shot intervals. did you happen to get any pics of the inside? Looks like there's a TI 555 chip at the heart of it. A TIP122 to run the solenoid and an L7812CV +12V regulator to run everything. Green wires from the transformer feed into a 4-diode bridge rectifier which feeds the L7812CV reg. 3 wires to the manual/auto switch, 2 wires to the adjustable potentiometer, 2 wires to the foot switch, a 6way connector to the dip switches, and finally a 2 wire connection to the solenoid. Looks like the dip switches just add more capacitance in parallel to increase the time constant for the 555. The air system isn't very complicated either. Air input feeds the regulator, which outputs to the solenoid and the pressure gauge. The air inlet also feeds to the "venturi" vacuum dial which provides the vacuum line to the solenoid. The solenoid is simply a 2 way valve that switches between the vacuum and pressure lines, and this feeds the air connection on the front of the unit. I don't use the vacuum function since solder paste is quite thick. It's only really useful for low viscosity liquids like glue. Also, the venturi valve continuously consumes the air supply to create the vacuum which will empty your compressor tank pretty quick. 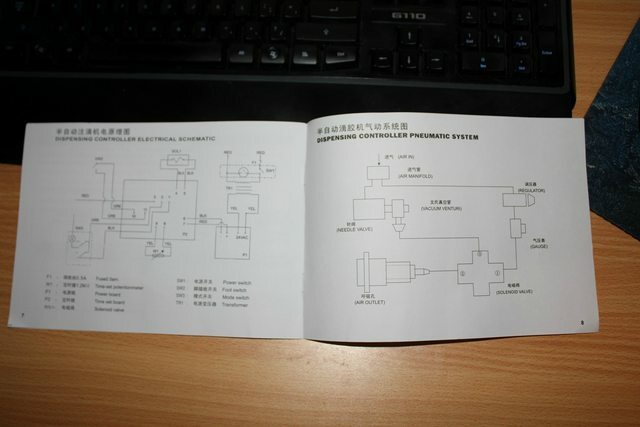 For what its worth, the manual that come with it was in both chinese and english. Spelling is almost perfect and covers pretty much anything you need to know. Has a wiring/pneumatic diagram in the back. Is it possible to use this machine for fine pitch components (like QFN or QFP) in some way? For QFP you can just lay down a bead of paste across all the pads (this is what I used to do manually with a syringe and plunger). Not sure how well it would work for QFN. You can get quite small dots of paste but you are limited by which tips you can use. The finer gauge tips are too small for the paste to be pushed through. I've recently bought a couple of these (well the KLT-983 - the digital type) for use by my students at the university, and so far I have to say it works a treat! The only problem is, it didn't come with an English manual. I don't suppose you know where I could download one from?? Nice video and review by the way, it was yours that made me buy them!!!! We've been playing around with a very similar unit. One of the guys replaced the 10K (?) pot with a 2K (I think) unit to get better control over the desired (shorter) time range. I'm glad you found the review helpful I couldn't find much on the net about them so I took a shot anyway. As for the manual in English, I don't think I kept mine. Not really much of use in there anyway except the dip switches at the back (which just change the time delay range). I've been toying with replacing the whole control board with something microcontroller based, perhaps building an LCD into it. Another thing on my list of "one day, maybe" projects. Just picked up one of these. Didn't realize it came with a non-standard (probably metric or something) air quick connect so it doesn't fit a standard compressor setup without replacement. The word "standard" is a relative term. I think we had to fiddle a little, but no big deal. Mine came with the standard (in Australia anyway) Nitto style fitting. I think the USA uses ARO style instead? I just bought one of these and strangely, I don't get the single-shot action in "AUTO" mode. Instead, it repeats over and over, without me even touching the button. The button doesn't work at all in this mode. In "MANUAL" mode, it performs as expected with a shot that lasts as long as I hold down the button. This is pretty useless as a one-shot, metered dispenser. I've been in touch with the manufacturer and they'll have me send the whole unit back. Frankly, I just want to fix it myself but I can't figure out what is wrong with it. PIN 3 seems to be held high by a resistor from VCC, and if I put it on my scope, I can see that it is occasionally being triggered by I-dont-know-what. I was probing around, looking for a short to ground that would drive this pin low, but I found nothing. I was hoping to find someone out there who could provide insight rather than me trying to reverse-engineer their circuit. What I can tell you is, after looking for obvious signs of fault (low voltage - nope 24V), bad components - nope, all values are as labelled, etc., I *did* find one diode that was installed backward, but after desoldering and reinstalling it as indicated on the PCB, nothing seemed to change. It *is* normal in AUTO mode for the button to work and for it to dispense a SINGLE shot of liquid, is it not? Two related threads here and here. These both contain some translations of the instructions and the dip switch settings. Those threads aren't quite related - they reference the 983A dispenser which has a completely different circuit inside. The 982A is based on a 555 chip and, as this thread's original author suggested, uses a collection of capacitors that are added to or removed from the timer. Thanks for the suggestion, but reading the manual isn't the issue here. What's interesting is that there are six wires coming from the DIP switch, but only five pins on the PCB. Mine happened to be set with the black wire at one of the ends disconnected. It would be WONDERFUL if someone with a *982A* type dispenser could take a hi-res photo of the PCB for a couple of reasons: As I mentioned before, one of the diodes was installed backwards, so I'm curious if the auto switch is also wired incorrectly. The manual suggests that on the three-pin connector going to the AUTO/MANUAL switch, it should be wired 1:black, 2:green, 3:red, but mine has green/red transposed. The green goes to power and lights the bulb in the switch. Black is ground. The red wire gets shorted to ground in AUTO mode and is open in MANUAL mode. I can't help but wonder if red should be connected to 24V instead. Knowing the connections between the three pin terminal on PCB and the terminals on the auto/manual switch would be immensely helpful. I recently obtained one of the 982A dispensers. As noted by torinwalker, the manual mode turns the valve on as long as the switch is pressed. In automatic mode, it outputs timed amounts, but it repeats them with the repetition rate determined by the Time knob on the panel. I traced the circuit board and sketched a schematic. It confirmed that this is the normal behavior of the dispenser. The 555 is actually held in reset state when in manual mode. In automatic mode, the 555 is triggered by a repeating pulse from a transistor circuit. I've designed and completed the PCB layout for a PIC based drop in replacement board. After I double check my design tomorrow, I'll send it out to have some boards made. I still need to write the software for the PIC, but that should be fairly straightforward. I intend to modify the operation so that the automatic mode pulse length is set by the Time knob. This should make it easy to adjust on the fly to get just the right amount of solder paste in each pulse. If anyone is interested in having one of the new boards, let me know. I completed a replacement controller board for the 982A dispenser. In the attached photo, the original board is the brown one. The new board is the green one. 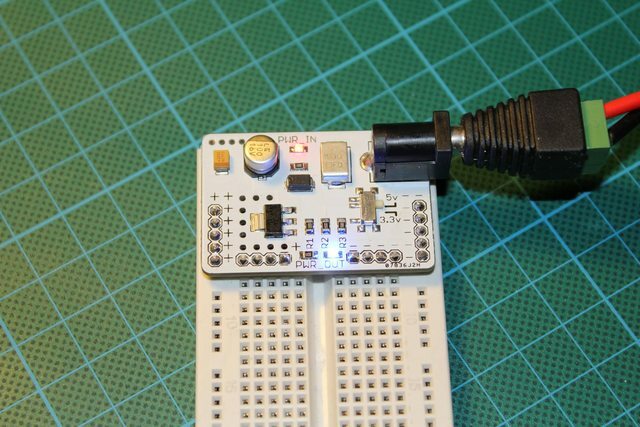 It uses a PIC24F32KA301 microcontroller and is a drop in replacement for the original board. I made some modifications and additions to the original functionality. - When on Automatic, the continuous sequence of pulses can be started by pressing the trigger and then stopped by pressing the trigger again. - A new function has been added and can be selected by the DIP switches on the back of the unit. In the new mode, the Automatic mode provides a single timed pulse each time the trigger is pressed. The length of the pulse can be adjusted using the TIME knob on the front of the unit. In Manual mode, a paste is continuously dispensed as long as the trigger is pressed (up to several seconds). This can allow dispensing of a long line of paste. I've been using the board for a few weeks now and it's working great. I have the same Sp982 solder paste dispenser. I would greatly appreciate, if you could share the design of your new board (PCB files, firmware,...).. Here are the design files for the dispenser timer replacement board for the 982A solder paste dispenser. See the photos in my previous message to see if they match the board in your unit. I have a few extra printed circuit boards. Let me know if you would like one. A bit more information: The unit I have is a JND Advanced 982A. It's powered by 120 VAC and has a separate internal power supply board which provides 24 volts to the timer board. The TIME control is a 1M ohm potentiometer. The DIP switch on the back has 4 switches and connects to the timer board via a 6 pin cable. Interestingly, the original board has only a 5 pin connector for the 6 pin cable to plug into. My new board uses a 6 pin connector. 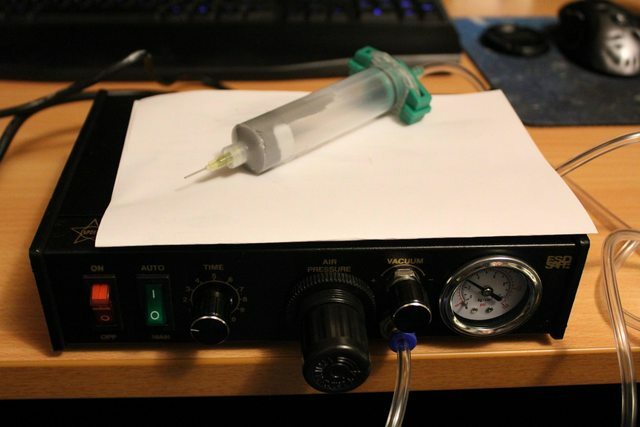 Here's some more information on the 982A solder paste dispenser. This information is about the separate 24 volt power supply board in the unit. A schematic is attached. It's a standard LM317 design. A photo of the board is shown. And a picture of the board in the dispenser unit is shown. The controller board in the unit is the custom board I designed for it. I'm adding this information on the power supply board because I've learned that some units have the power supply combined on the main controller board and if someone wants to use the custom controller design I've provided and they don't have a separate power supply board, this information can be useful to build a power supply to feed the controller. The output voltage from the LM317 regulator is set by the formula, Vout = 1.25 x (1+(R2+R17)/R16). In my unit, the original resistors were as shown on the schematic and were producing an output voltage of 25.7 volts. The specs for the solenoid valve allow a voltage range of 19.2v to 26.4v. Even though the output was in the allowable range, I replaced the resistors to give an output closer to 24v. I've replaced them with R2=220 ohm, R17=4700 ohm, and R16=270 ohm. Now the output voltage is 24.6v. The power supply board dimensions are 2 inch (50mm) x 2.5 inch (64mm). The hole spacing is 1.62 inch (41mm) x 2 inch (53mm). The AC from the transformer was measured at 21 VRMS or 29.1 V peak. This provides 27.2 V at the input of the regulator. The regulator has a heat sink. The solenoid valve is rated at 3 watts. So the regulator should be able to dissipate about 0.5 watts. I think it should be OK to operate at this dissipation level without a heat sink.